Julien Solari at Thierry Voisin tells me he's found a buyer for the 28.1 metre motor yacht Red Sky, listed for sale by Foulques de Raigniac at Camper & Nicholsons. Red Sky was built in GRP by French superyacht yard Guy Couach and delivered in 2002 as one of the yard's Couach 2800 series yachts. A warm, classic interior accommodates nine guests in four staterooms comprising a master suite, VIP stateroom, a double and a twin, all with en suite bathroom facilities. 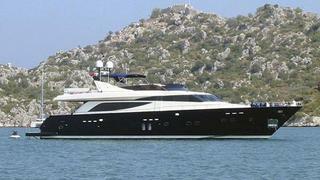 In 2012, she had a successful Bureau Veritas survey along with maintenance work on the gearbox, engines and generators. On deck, there is plenty of space for al fresco dining, and the sun deck includes a Bimini top for additional shade. Professionally maintained by a full-time captain, Red Sky is commercially registered and her twin 1,500hp MTU engines give her a cruising speed of 21 knots and a range of 1,000 nautical miles. Red Sky was asking €880,000.